Hey everyone! Royale of But First, Party! here. 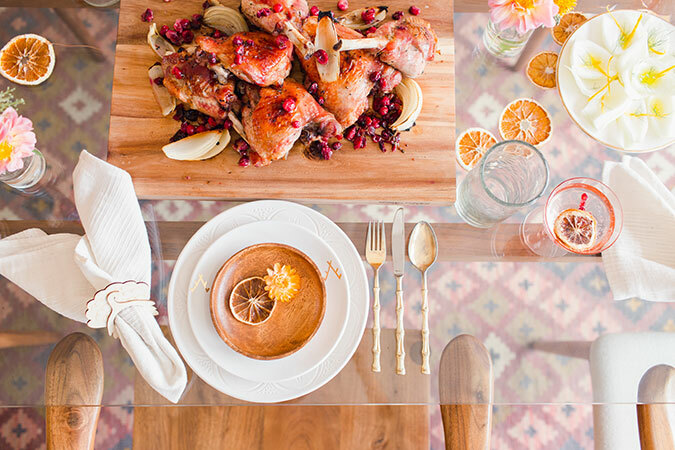 When I started putting together design ideas for this year’s Friendsgiving, I knew I had my work cut out for me considering how stunning last year’s turned out. 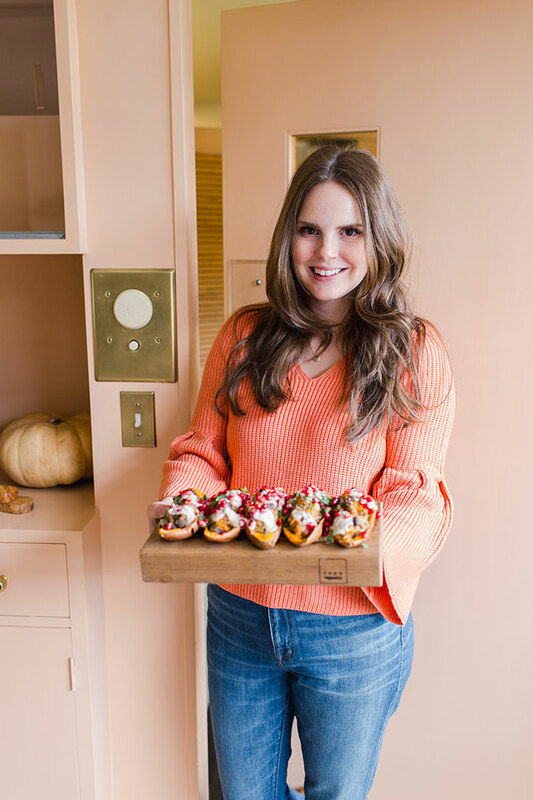 I still dream about those liege waffles with salted milk chocolate that Claire made! 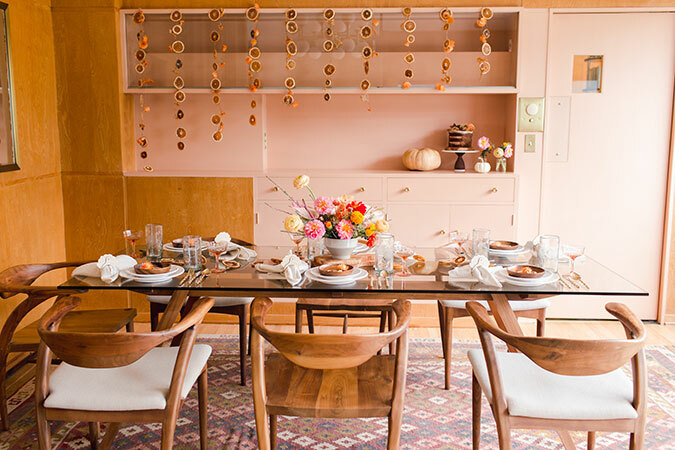 Luckily Claire offered to host once again at her gorgeous home, but surprise, it’s brand new and I could not have been more excited to break in the dining room. Similar to last year, I really let the tones found within the space inform the design direction. 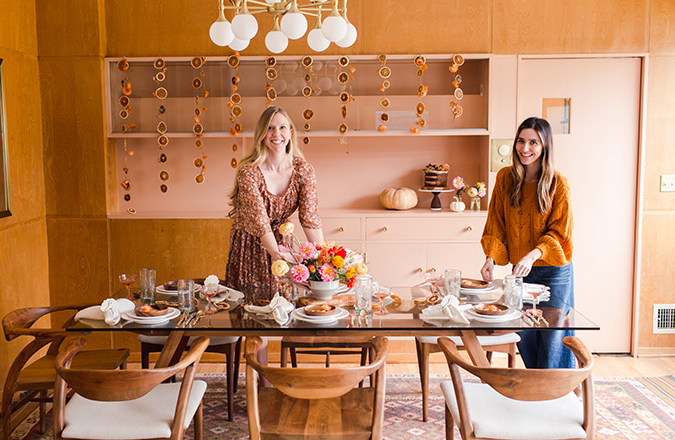 Claire’s dining room (and whole home) features stunning midcentury wood walls, so I knew that Thanksgiving brown was covered. Check. 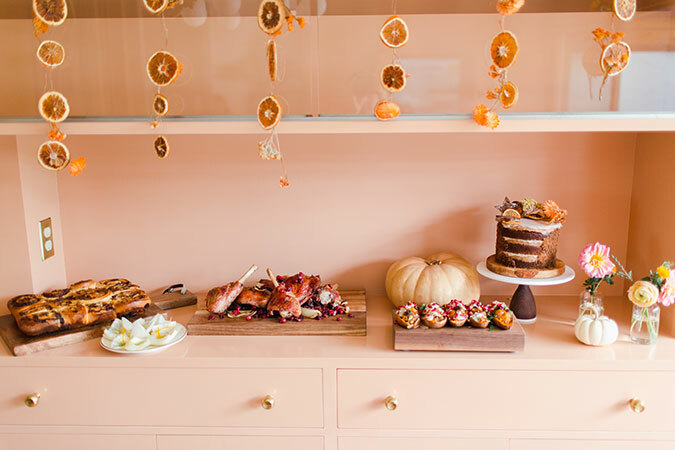 Which left me finding ways to incorporate other autumnal tones like orange, which brace yourselves, I am kind of obsessed with thanks to this setup! And of course, it wouldn’t be a Oui Party without some pink. 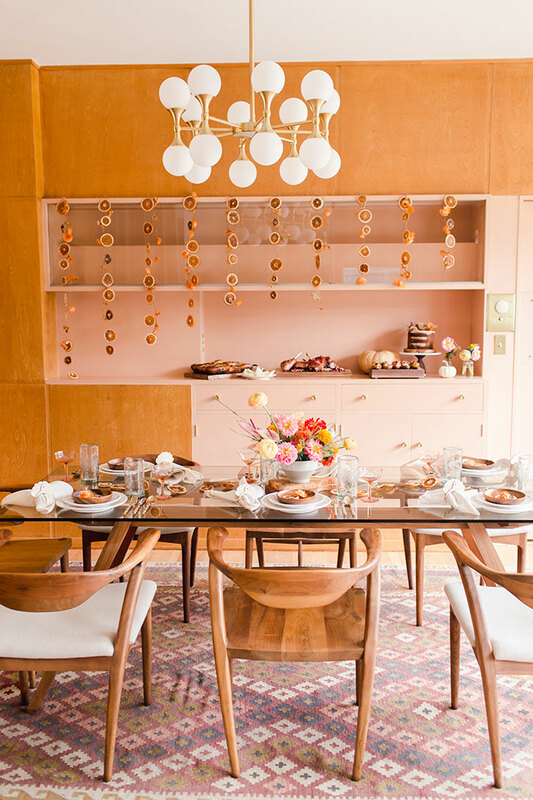 Would you believe it, the built-in shelving and door to the kitchen are painted the most gorgeous shade of blush—the original color when the house was built, might I add. 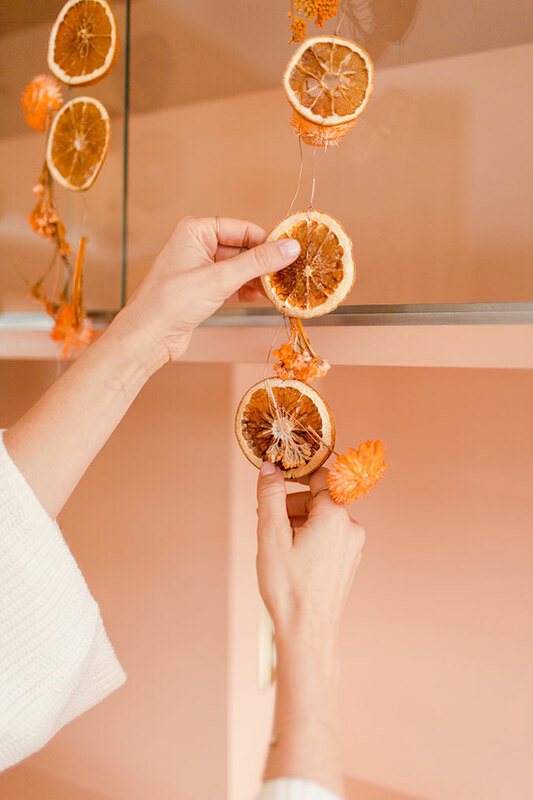 Going back to orange, one trend I have been dying to try is using dried citrus garlands for decor. 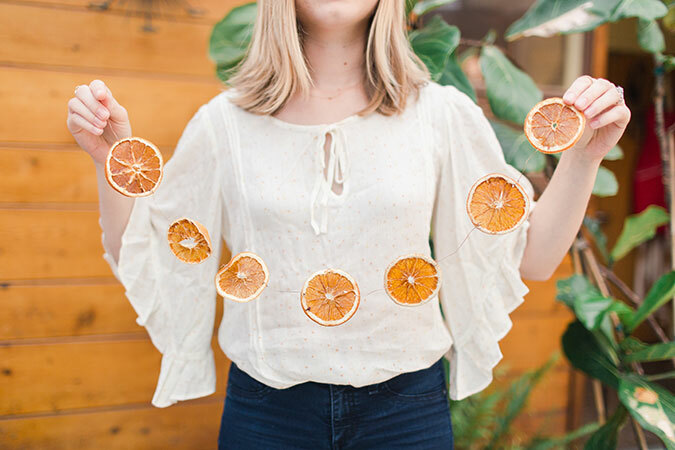 I have been obsessing over the work my friend Ashley Renuart does with all sorts of dried natural materials, and was thrilled when she offered to lend us some from her stash! 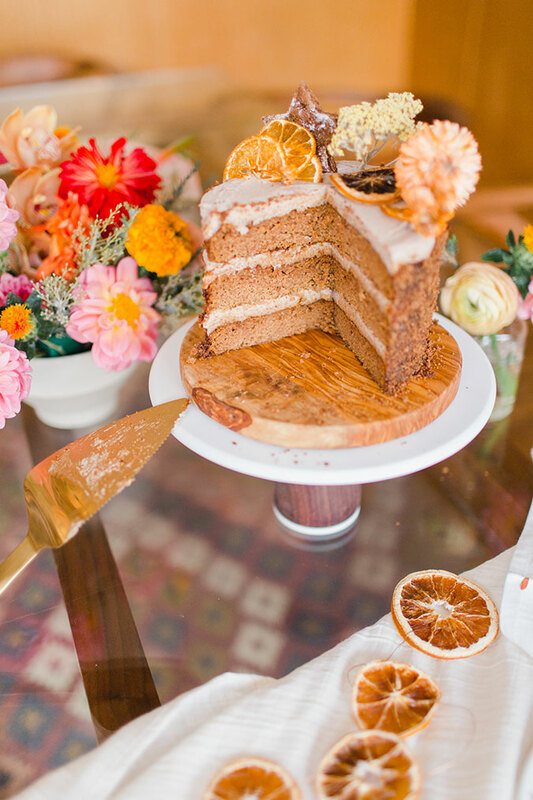 Claire also referenced citrus notes throughout the main course and dessert, which you’ll have to stay tuned for later this week! Another bonus? 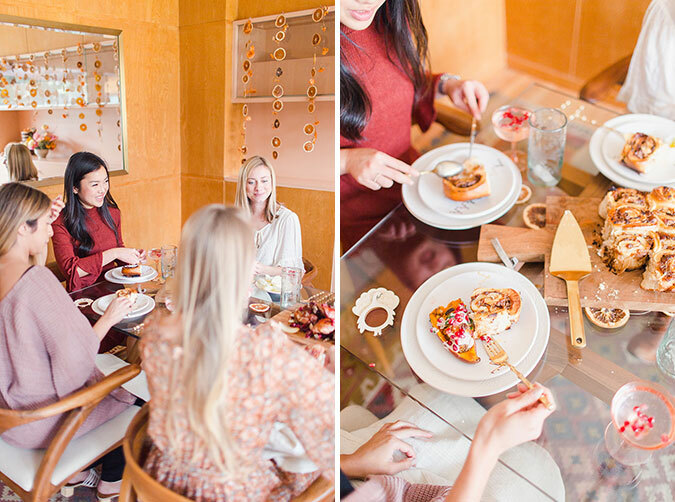 Lauren’s latest LC Lauren Conrad collection is full of sweaters and festive dresses in all of the warm hues you could ever want. So you know that all of us dressed in our LC best for a celebratory night in. 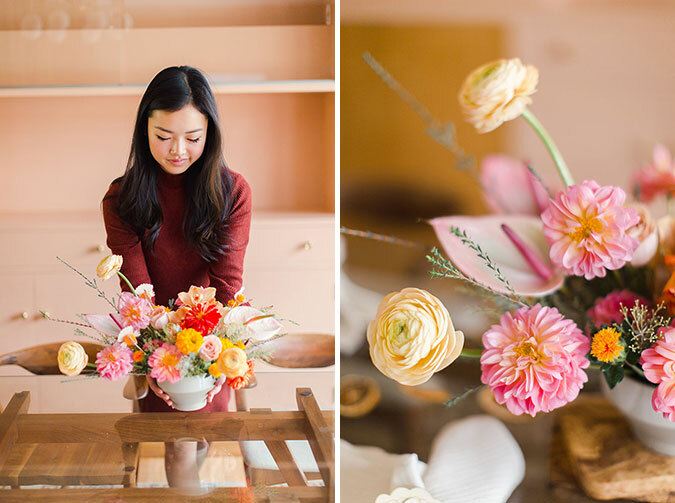 Another standout orange moment were the florals, which Dawn of Earth Baby Flowers had me expressing my deepest gratitude for. 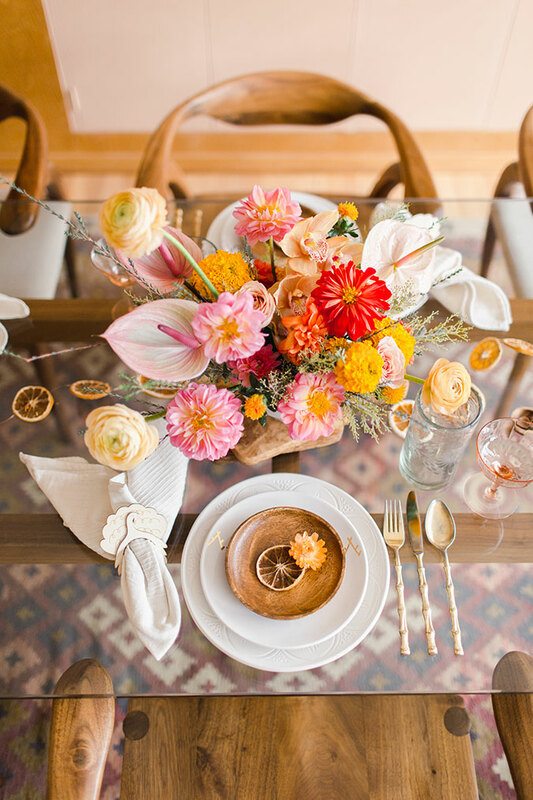 The blush, corals, and pops of orange instantly added warmth and brightness to the table. 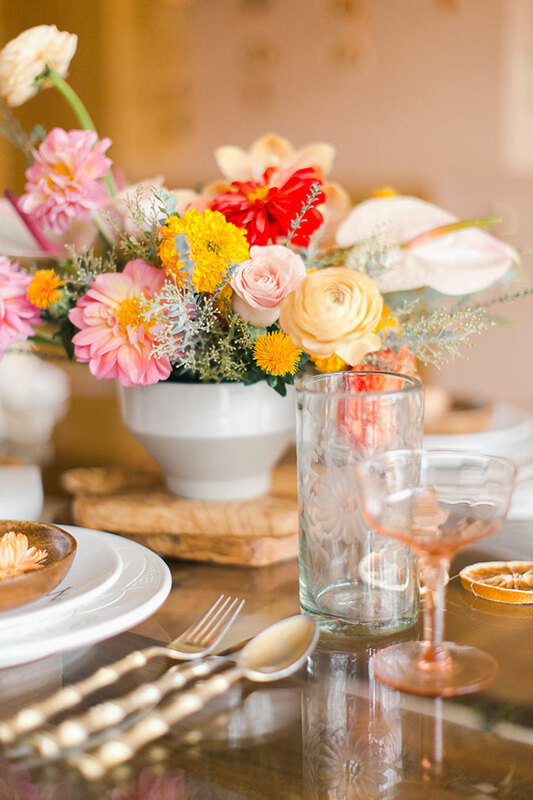 The centerpiece also tied in nicely to the tones of the acacia wood plates from The Little Market. Other holiday tabletop must-haves from The Little Market include the ceramic white and gold dishes we used, these tall leaves water glasses and cream woven cotton napkins. Which, by the way, looked so cute when pulled through wooden turkey napkin rings from Bonjour Fête. 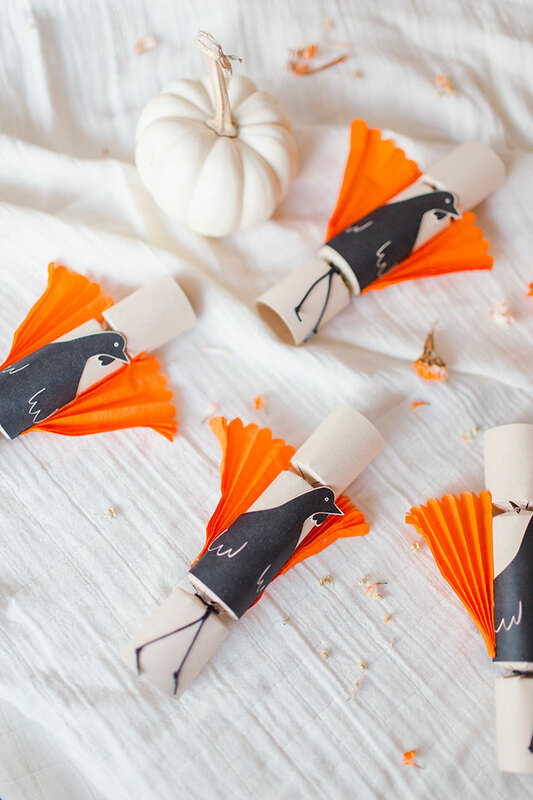 Rachel has all the best Thanksgiving goodies, how festive are these crackers!? It was a lovely time spent with good friends! Friends who inspire me with their work and their general boss-babeness, and great food all around. And, dare I say orange is the new pink? OK, it’s not. But orange is pink’s new best friend. 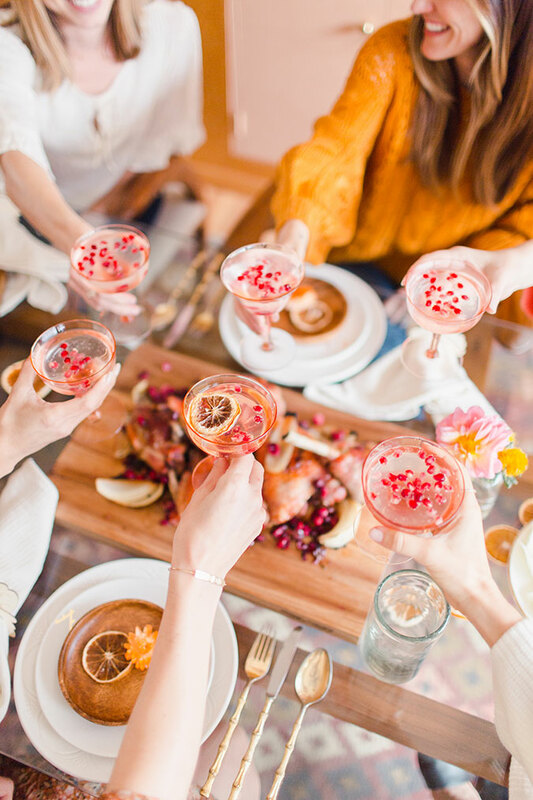 Anyone else swooning over this Friendsgiving? Tell me what you thought below!